Join award winning landscape photographer Andrew Slaton in one of America's most remote and stunning National Parks, Big Bend, to learn about the art of seeing with fresh eyes. Take your art to a new level and see this rugged, beautiful country. 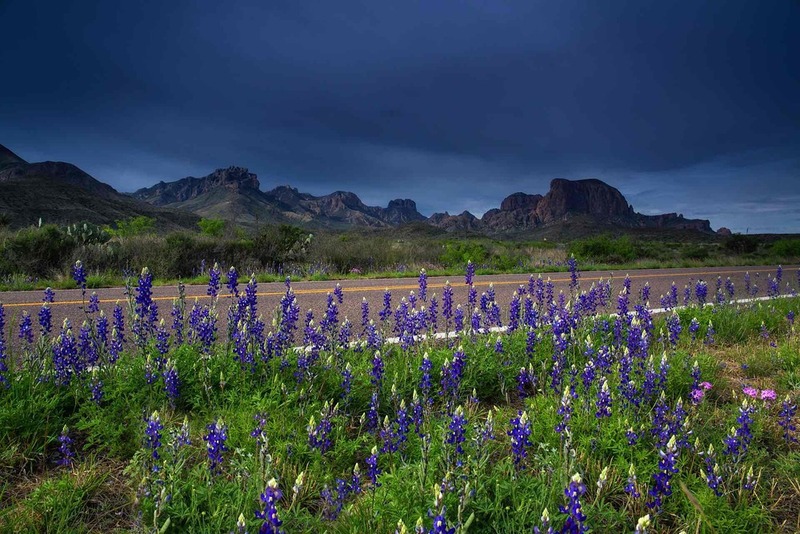 Big Bend is one of the most remote and least visited national parks. It is also the best for seeing the night sky in all its glory! So on this exciting workshop, we will focus on night photography, but we will also plan to be there for peak WILDFLOWER season, when the desert really comes alive! So that means we will be playing around with the exciting technique, light painting, capturing the heavenly bodies with colorful wildflowers. And as always, we will discuss and shoot landscapes & general nature. Astro Photography - You’ll get very used to your siestas on this trip, as we will spend the first hour or two before sunrise and after sundown navigating the exciting night sky with our cameras. We will discuss and execute several techniques including night landscapes, star trails, painting with light, and more! What’s NOT Included? Meals are not included, though we will try to eat together as much as possible, since it's a great chance to continue talking shop. Transportation to and from our campsite in Big Bend are also not included, as well as anything not specifically listed above. Travel insurance can be purchased separately, HERE, but not necessary. Price - $1000 which includes your pre-workshop materials and Skype Q&A, 4 days of photography instruction, all park fees, 3 nights camping (Thurs. - Sun. ), bottled waters and snacks in the field, and photo feedback and discussion sessions. Transportation to and from the park and within the park, lunch, dinner, and all other expenses are not included. Deposit - A refundable* $250 deposit is required to secure your spot. Travel - Big Bend National Park is quite remote. However, there are a few airports within a reasonable driving distance. The closest airports are Midland-Odessa Regional Airport (MAF), which is 220 miles away (3-4 hr drive) and El Paso International Airport (ELP) which is 315 miles away (4-5 hr drive). For reference, the drive from Dallas and Houston is approximately 10 hours for either. Lodging - Group camping with instructor is included. But keep in mind, accommodations are extremely limited! We will do our best to get a group site within a 5-10 minute drive to the restroom, but this is not always possible. If you have any specific questions, please contact Andrew directly. If you are not comfortable with primitive camping, please consider other options. Lodging is also available in the Chisos Basin for around $125-175 per night, at the cost of the student. Rooms fill up fast, especially this time of year, so book early. Meals - Snacks and water are provided, but meals are the responsibility of the student. There is only one restaurant in the park, and that is where we will tend to eat as a group, so please make arrangements if you have special dietary needs. Transportation – Once in the park, everyone will follow Andrew in their own vehicles to each location. Students are encouraged but not required to consolidate into as few vehicles as possible. Additional fuel within the park is the responsibility of the student. Thursday - We will be meeting in Big Bend National Park at Panther Junction promptly at 4:00pm, we will then head out into the field as quickly as possible to have some fun! Please be sure to give yourself enough time to check in (if lodging in the basin) prior to our initial meeting, as we will hit the ground running and not finish until later Thursday night, after an introduction to night photography. Friday - Rise early to photograph sunrise in the Chisos. Break for lunch together with discussion. Nap time! Regroup at 3 to head to the next location to shoot afternoon/ evening light. Break for dinner together. Head out to shoot star pictures in the mountains. Saturday - Rise very early to photograph the stars before dawn. Shoot at several locations throughout the morning. Break for lunch together with discussion. Nap time! Regroup at 3 to head to the next location to shoot afternoon/ evening light. Break for dinner together. 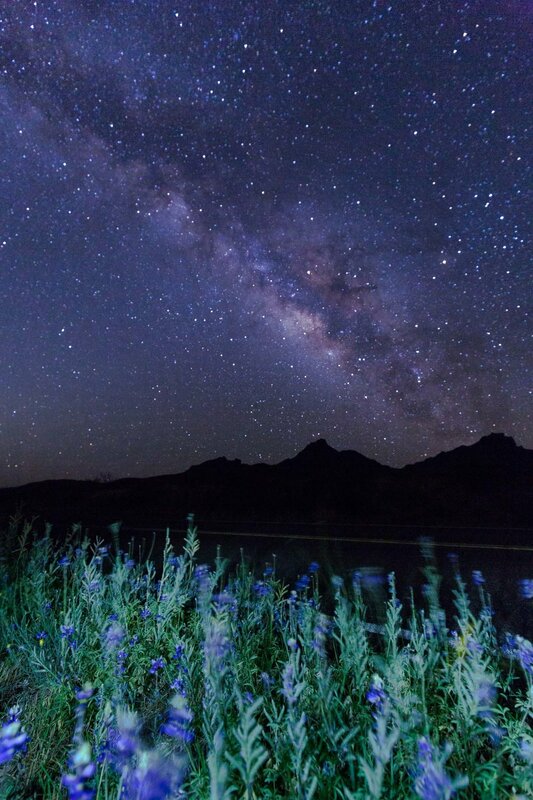 Head out to shoot star pictures in the desert. Sunday - Rise very early again to photograph the stars before dawn. Shoot at several locations throughout the morning. Break for lunch together with our laptops to discuss and critique our work from the trip! We will then head out to shoot and learn throughout the afternoon and evening. The workshop officially ends after sundown, but students are highly encouraged to stay in the park as long as possible to continue exploring the amazing landscape of Big Bend!